Utility bills always sky rocket when winter comes. So, when you’re sitting in your cold room and on a tight budget with heating costs, the Lasko 755320 Ceramic Tower Heater is perfect for staying cozy and cost effective. The Lasko heating tower is loaded with modernized features. The 50’s were charming with their small cubic space heaters and wiry flaming coils, but c’mon this is 2011 and we have moved on. The control console on the top provides all the simple use you would need to get out of this. It features a digital display that’s easy to read, even from across the room and with the option of choosing low or high settings. You also have the choice of having the tower oscillate so heat spreads evenly around your room or the space you are heating. It’s quiet, which is convenient for sleeping, and has an 8-hour timer so you don’t have to worry about the heater running all night long. For those of you worried about the dangers of over-heating, the Lasko Tower Heater has an over-heating automatic shutdown sensor. It comes with a remote control and batteries so when you are sitting down in your bed you can control it at your leisure. Lasko provides a three year warranty, too. According to consumersearch.com, they’ve racked up a list of pros and cons. This product is great for college students or those living with roommates in an apartment in colder cities. Its personalized use allows you to control the temperature of your room rather than the overall climate control of your house or apartment. I know I cherish my space heater because I generally like my room ten degrees warmer than the rest of the house, but don’t want to pay for high heating costs. And if you aren’t a thermophile but want a little more warmth, there are smaller comparable products out there, even within the Lasko product line. Impress makes space heaters on the cheaper end, or if you want something more robust Delonghi also makes higher end space heaters. 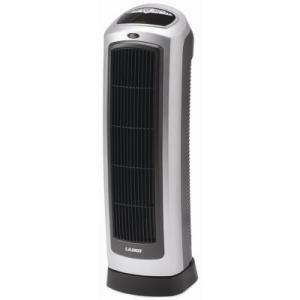 The Lasko 755320 Ceramic Tower Heater does what it is meant to do: heat up a room. I think the cons list is pretty inconsequential. Avoiding expensive heating bills and having the convenience of small space heaters, the price is on par with performance.